Tiny computers are gradually becoming better and more useful. I think this trend is positively correlated with the manufacturers' decision to use Linux (when that's true). 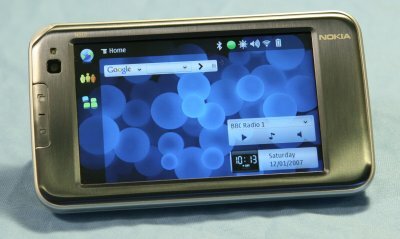 The Nokia N810 uses Maemo, a carefully designed, lightweight Linux distribution that tries to squeeze as much performance as possible into the smallest storage footprint. I have a particular weakness for tiny computers. I am frequently away from conventional sources of power and I often carry everything on my back (or in my kayak) to get where I'm going. So I find myself buying these little machines again and again as the years go by. But I confess the real fun begins when I figure out how to thwart the manufacturers' valiant efforts to keep their customers on the Kansas side of the user interface (think: Dorothy). Not that there is any great challenge involved (so far) — after all, it's Linux, an operating system designed to be accessible and transparent. But, having said that, I want to warn my readers. This is not an article about how to download music more easily, or watch videos on YouTube, or change the colors of the user interface. This is about finding out as much as possible about the machine's insides, and there is a certain amount of risk involved. If you are not comfortable with hacking (with the old, positive meaning), if you are not skilled at following instructions to the letter, and if you are not willing to possibly brick your shiny new toy, then don't follow the instructions in this article. I have added this cautionary note, not because these instructions are inherently risky, but because someone who is careless in executing them could get into difficulties, just as would be the case if a person always logged onto their system as root, and for the same reason — the most useful procedures in this article must be carried out with root authority. Out of the box, it is virtually certain that the Nokia's OS version won't be current. Let's deal with that first, before making any settings that will be wiped out during a subsequent OS update. Write down the number listed for "WLAN MAC Address", we need this later on. Note the OS version — mine was 1.2007.42-18 as delivered, one version behind. Go to this page and download the item marked "flasher-3.0" onto your desktop machine. This choice assumes you are a civilized person and are running Linux. Go to the wiki page "Updating the tablet firmware". Bookmark this page. It has detailed instructions for flashing the Nokia. Click the link to the software upgrade (it won't actually download the listed version, you'll be choosing later on). On the next page, for "Product ID", enter the WLAN MAC address you recorded earlier, but leave out the ":" symbols from the original address. On the next page, accept the software agreement. Now select and download the most recent version of the operating system. Put the new software image and the flasher-3.0 application downloaded earlier into the same directory. If the Nokia is turned on, turn it off and disconnect its power adaptor. Connect the Nokia to your PC with the provided, unique-to-Nokia micro-USB adaptor, but leave it turned off and disconnected from its power adaptor. As root, execute the flasher application like this: "./flasher-3.0 -F (name).bin -f -R", substituting the OS file name you downloaded. Wait until the flasher application prints something to the effect that it can't find a suitable USB device. Now plug the power adaptor into your Nokia. The OS replacement will commence. I've covered this update step first because replacing the OS wipes out all user settings and customizations. Remember this for the future — any time you upgrade OS versions, either back up all your settings or accept that they will be erased. NOTE: Do remember this OS replacement procedure, and keep a copy of the current OS version at hand. If things go wrong and the Nokia enters a mangled state, as a last resort one can nearly always recover by re-flashing the OS with a fresh copy. Again, I remind my readers there is a certain amount of risk in these procedures, and if you aren't comfortable with root-authority command-line procedures, if you simply want stable, reliable performance and zero risk of turning your Nokia into a paperweight, I suggest that you skip this section. The first step is to establish a Wi-Fi connection. Bluetooth is also available, but I don't think you can have Secure Shell (SSH) across Bluetooth, so it's not important at this stage. By default, the Nokia will seek out and connect with any available Wi-Fi access point using DHCP (Dynamic Host Configuration Protocol) to get the information it needs. If you have a Wi-Fi access point, the simplest approach is to set it up to negotiate a DHCP transaction. Enter a suitable IP address, netmask, gateway (Maemo uses the term "Router") and DNS addresses. Didn't that seem like a lot of trouble compared to using DHCP? Well, yes, but in exchange, you don't have to figure out which address DHCP assigned to the machine for the next phase. DHCP may be a technological wonder and a great labor-saving device, but it won't normally tell you which machine got which address (a new Linksys wireless router will tell you if you know where to look, but that is an exception to the rule). If practical, configure the wireless router to assign just one address, then turn on the Nokia. Provide this MAC to the wireless router's static DHCP feature, and pair it with an available IP address. Give "nmap" the same range of addresses that DHCP is using for its assignments, like this: "nmap 192.168.0.50-149" to scan the address range from 50 to 149 inclusive on net 192.168.0.0. The Nokia will appear in the result list as a machine with no open ports (at this stage). To use "tcpdump" most efficiently, you will need to know the MAC address of your Nokia 810. The MAC address is listed under "Settings ... Control Panel ... About ... WLAN MAC address". The desired number looks like this: nn:nn:nn:nn:nn:nn, where each "n" is a hexadecimal digit. Having acquired the Nokia's MAC address, as root invoke "tcpdump" like this: "tcpdump ether host (MAC address)". Once "tcpdump" is monitoring, bring up the Nokia's network interface. When the Nokia has acquired an IP address, it will appear in the "tcpdump" output. With the Nokia's address, we can move on. Click the globe symbol at the upper left of the Nokia display. Choose "Open new browser window." Enter "http://gronmayer.com/it" into the address window. There are actually many software repositories on the Web, this is a personal favorite that seems to have a wide selection. Scroll to the bottom of the page and click "Select All Repositories." You can always delete some or all of them later, this step assures you will have a wide selection. Click the "Install Selected" button. Click "OK" to a bunch of "Add Catalog" prompts that will appear, one for each repository. The above steps automatically launch the application manager, but you can also launch it by clicking the four-blocks icon and choosing "Settings" and then "Application Manager". Scroll down to "Becomeroot", select it and choose "Install". Now we have "becomeroot" available to get around a problem with the Nokia N810 — it doesn't have a root password and no straightforward way to create one. Ordinarily one would execute "su" and get to root access on a new system because there is no assigned password, then assign one. But the Nokia N810 is set up so there is no defined root password and no way to assign one — except by way of "becomeroot". Click the four-blocks icon and choose "Utilities". Scroll to the bottom of the list and select "Xterm". Type in "sudo gainroot". You will see a root prompt. Execute the "passwd" command and carefully assign a root password. Now let's install a Secure Shell server. I know there is a lightweight version called "Dropbear," but it suffers from a number of defects, not least that it is called "Dropbear" and I keep losing touch with the small group of neurons responsible for connecting the name of "Dropbear" with the notion of "SSH." Return to the application manager, select and install "openssh-server". The installation process will automatically generate a system-wide key and open port 22. This means we should be able to log onto the Nokia from any PC on the same network. Specifying the username "root" is a bit of overkill given that this is a root shell (signified by the "#" at the left), but I tend to include it for clarity. The local Secure Shell client will ask whether it should add this new entity to its list of known hosts. Say yes. Then enter the previously assigned root password. If you have been careful up to this point and have made no major mistakes, you should be in. At this point we can create another user apart from the default user (named "user") that is the client for the installed applications. The reason we do this is because we might have a pedestrian task to perform, one that doesn't justify being root (don't be root if you can avoid it), but we can't log on as "user" either, because "user" doesn't have a password and cannot have one assigned (I haven't sorted out the difficulties that might attend creating a password for "user"). Log onto the Nokia as root from the desktop machine using the Secure Shell connection established above. As root, enter "useradd -g users -G video,audio,dialout -m (username)". This will create a home directory and an entry in "/etc/passwd" for the new user. To assign a password for the new user, as root type "passwd (username)" and enter the desired password. It's a good idea to maintain an ordinary user account that isn't either burdened with a special role (as "user" is) or has root authority. Now that we have shell access, we can begin to address issues not formally dealt with by Maemo's user interface. In Maemo one cannot directly configure a 24-hour clock display, instead one chooses a locale, and if your locale doesn't support a 24-hour clock, you cannot have it. The first thing I tried was setting a locale that did have a 24-hour clock display — Germany. The problem with this solution was that Websites that honor visitor locales would read my chosen locale and produce German content, and my German isn't good enough for that solution. On the Nokia, edit the file /etc/osso-af-init/locale. Add this line: "export LC_TIME=fi_FI"
This also changes the date format, but that is a small price to pay for a 24-hour clock. A digression. For my readers who don't understand the significance of a 24-hour clock, I must say it's one of those things that you either already understand, or may possibly never understand. It's something intuitive, like preferring the word "aluminium" over "aluminum", or "regardless" over "irregardless". Next year there will be less soldiers in Iraq. Next year there will be fewer soldiers in Iraq. If you don't see the problem with sentence A, the style overwhelmingly favored by George Bush, then you also won't care about having a 24-hour clock. echo "Can be run only on Nokia, quitting." But what I have not figured out is how to automatically run this script at intervals — there is no "cron" facility in the Maemo version on the Nokia, no realistic prospect of installing "cron", and no obvious way to schedule a periodic action. There is a directory "/etc/cron.daily" present, but without a running cron daemon, I suspect this directory is an artifact, an oversight. In any case, once per day isn't often enough for optimal clock setting while moving the Nokia from place to place. Update: A reader named Laszlo Marai has suggested that a script be placed in /etc/network/if-up.d/ to run "ntpdate" every time the Nokia connectes to a network. This seems like a good idea for those who are constantly connecting and disconnecting while roaming between wireless networks, as most people do. This next step is more daring and upscale — let's create a file listing of the Nokia in the PC's Konqueror file manager (you are running KDE, yes?). Open Konqueror in file manager mode. Enter "fish://root@192.168.0.81/" in the address bar (replace the example address with that configured in the prior section). Enter Nokia's root password when prompted. You will see a Nokia root directory list in the right-hand pane. Be careful browsing this list. Remember you have root access. In the above section we gained access to the Nokia by way of wireless and SSH, which opens up a lot of possibilities. We can browse for specific files, replace default configurations with custom ones (thus avoiding the task of typing too much on the little Nokia keyboard), and expore. Until recently, Linux network configurations have been rather poor, difficult to automate and understand, but the present Maemo scheme is very well-defined (it's described here) and easy to understand and change. It relies on clear, strictly defined XML configuration files. I didn't find this out by browsing around inside the Nokia. Instead I used "scp" to copy the entire /etc directory tree to my desktop and searched it there, looking for particular names that I knew would be present (for some reason, searching the /etc directory tree remotely via the "fish" protocol wasn't able to read all the files). I went to this trouble because setting up a network interface can be quite a pain if carried out on a tiny keyboard, and I expect to be upgrading operating system versions with some regularity, after which I can restore the saved configurations back onto the Nokia. Again, as you set up your own network configurations, be sure to notice the "advanced" button that appears in the last step. This advanced button leads to a dialog that chooses DHCP or static addressing and other similar options. Click the four-blocks icon at the left of the Nokia display. Choose "Settings", then "Control Panel". Activate options "Bluetooth On" and "Visible". At the desktop machine, launch a Konqueror file manager and type "bluetooth:/" in the address bar. Click the Nokia icon when it appears on the right-hand window. Click "Obex Object Push" when this icon appears. A dialog will appear. Choose "Open with 'kbtobexclient'". Now you can transfer files to the Nokia. This is obviously less powerful and comprehensive than the SSH access method described above, but it is also a great deal safer. The Nokia comes equipped with a special USB cable with a super-tiny connector on one end that is probably unique to Nokia. If you connect this cable between the Nokia and your desktop, and if you are running a recent Linux distribution on the desktop machine, you will see one or two new icons appear (one if you don't have a mini-SD memory card installed in the Nokia, two if you do). This turns out to be an easy way to quickly transfer a lot of data between a desktop machine and the Nokia. There are certain internal hints in configuration files about either USB hosting or USB networking, but these are not mentioned in the documentation and are probably not supported. The Nokia cannot be charged by way of a USB connection, at least not directly. There is an adaptor available that fits between a normal USB cable and the Nokia power port. Turn on your cell phone and make sure it is Bluetooth-visible. Launch the Nokia control panel, choose "Connectivity ... Phone." Select "New". This will make the Nokia scan for Bluetooth devices. If the cell phone is set up Bluetooth-visible, it will show up in the list. Click the cell phone entry on the list and enter its passcode. The next dialog determines country and cell phone provider. Enter these and close. Now, in control panel, go to "Connectivity" and choose "Connections". Select the cell phone from the list and select "Edit". Choose "Next" at the first dialog. For the basic "Quick2Net" service, enter a phone number of "#777", a login name of "qnc" and a password of "qnc" (deselect the "prompt for password" option). At the next dialog, it appears that everything is finished, but, as before, notice the "Advanced" button at the right. Click it. In the next dialog, select the "Other" tab, and for "supplementary AT commands" enter "AT$QCMDR=2". This should allow you to access the Quick2Net service on-demand from the Nokia. It's not fast, but as I understand it, the service only costs you airtime. These instructions are obviously Verizon-specific, but they show how to enter non-standard options that will be useful when configuring for other providers. Maemo has a very slick mechanism to decide how to get Internet access. First, you tell it which options to exercise (in Control Panel ... Connectivity). Next, given the user's preferences, Maemo makes pretty intelligent decisions — it doesn't connect until it needs to, and it makes the best choice when alternatives are presented to it (by, for example, choosing the best access point signal from a list of alternatives). Again, this scheme is fully described here. As usual in modern times, users expect more than technology can possibly deliver. All one needs to do is visit YouTube from the Nokia and click a few links, to see how quickly the machine gets bogged down trying to play videos (I have a pretty fast internet connection and a 802.11G-capable wireless router). But this isn't a criticism of the Nokia, it's an obvious and predictable limitation. As I get older, I encounter more and more things that only fit in the "Miscellaneous" category. This is the technological equivalent of an experienced mother's remark: "Before, I had six rules and no children. Now I have six children and no rules." On the top edge of the Nokia there are two controls to the left of the power button. The leftmost button maximizes/restores the active window, and the next control to the right, a rocker with "-" and "+" symbols, is used to zoom the current window's fonts and images. Both controls can be operated with one hand while doing someting else — they're a nice touch. Once you have set up some e-mail accounts (you may configure multiple accounts), a system daemon periodically checks the status of the accounts. If there are new messages, the LED at the upper left of the Nokia flashes blue to alert you. This feature works whether or not you are running the e-mail program. Pretty slick. At first I couldn't figure out an easy way to scroll up and down in a Web page. I thought how difficult it would be to read a book in this unit if I had to use the scroll tabs to navigate. Then, quite accidentally, I discovered you can drag the page with the stylus or a fingertip, directly in the main part of the display. The browser crashes a lot (I am running Maemo 1.2007.42-19). This happens at any number of sites, but for confirmation, one can reliably crash the browser by visiting one of my pages on this site and double-clicking a word to get its dictionary definition (most of my pages have this feature). In fact, now that I think about it, at the time of writing this very page will crash the Maemo browser if the user double-clicks a word. There is a GPS receiver built into the Nokia, as well as a mapping program. After a lot of testing, I have concluded that the GPS lacks sensitivity when compared to a dedicated GPS receiver. I use GPS receivers quite a lot, both for serious navigation while boating in Alaska as well as for hiking, and I have certain expectations that a GPS needs to meet. In side-by-side comparison tests with a Garmin GPS receiver, I found the Nokia was unable to acquire and maintain a fix nearly as well as the Garmin, and sometimes failed to acquire a fix at all while the Garmin functioned normally. Notwithstanding these drawbacks, in most circumstances the Nokia can sit on your car's dashboard (mounting bracket provided), and (assuming you have a typical sloping windshield to give the Nokia a view of the sky) you should be able to track your progress on its moving-map display. The map application bundled with the Nokia is sadly lacking in basic refinements. In truth, it is one of those crippled non-applications meant only to tease you into buying the "full-featured" version. It would be nice to be able to to import and export waypoints between the map application and the rest of the world, but this feature isn't provided. Without a waypoint import/export capability and a reliable way to create and display waypoints, this map application just can't be taken seriously. There isn't a decent organizer/scheduler application available at the moment. One can set basic alarms in the "Clock" applet, and one can install "gpe-calendar" from the repositories, but the latter isn't particularly advanced. I think someone will eventually recognize this lack and produce something reasonable for this class of machine. The provided media player performs well, given my simple requirements. I purchased and installed an add-on mini-SD memory card, 4GB (near the upper limit at the time of writing), then loaded part of my MP3 music library onto it. The media player automatically found and cataloged the music (helped along by my having included ".m3u" index files, a process explained here), then I found it easy to use the media player to locate and play things. The media player also has a big index of Internet radio sites. Unlike a typical desktop Linux distribution, Maemo as provided with the Nokia is preloaded with drivers for MP3s and other common audio formats, as well as a number of common video formats. The Nokia has a small Webcam as well as a light sensor on the front panel. Unfortunately, at the moment it seems there is only one application that supports the Webcam — Gizmo. To see the picture Gizmo sends from the Nokia, you have to (1) run Windows, and (2) download a beta Windows release of Gizmo 4.0. After a great deal of thrashing around (I dislike running Windows even for a test), I was able to perform a full-up test of the Webcam. It will be nice when there are more uses for it, and I don't think the current Internet is quite ready for real-time, no-delays, two-way video chatting. For those who are into VOIP and handhelds, I think Skype will remain the application of choice. Skype doesn't support the Webcam at the time of writing, but it behaves well as a Nokia application. As is so often the case with handhelds, Java is not supported in the browser. I have quite a few Java applications and applets scattered around my Website, so I quickly notice the absence of Java. I suspect the reason is the big footprint of the Java runtime engine and how this conflicts with the strict storage and memory limits imposed by a typical handheld. I hope I'm not sounding overly critical. This browser is a big improvement over what existed in the past for this class of computer, and I'm sure it will improve further. I find I can productively visit The New York Times and similar sites that demand a lot from a browser. Overall I am impressed by this Nokia unit. It does a number of things very well. I especially like how it autonomously connects to the internet in a complex environment with multiple access points. I would like to have seen a better mapping capability and a better GPS receiver, but I realize this is a personal priority that may not be shared by other purchasers. I think with a small additional effort a unit like this could become a TomTom challenger, just because it would do so many things besides get you where you're going. Thank you for putting together a very very informative guide on the Nokia n810. I was fortunate enough to find your site within an hour or so after charging my 810 for the first time. Your site made it possible for me to quickly and easily connect the 810 to my home wireless router. I look forward to using the balance of your guide. Thanks again. Thank you! I'm glad my guide came to your attention.